Across India, particularly in Central India in regions like the Tadoba Andhari Tiger Reserve, coal mining is wiping out critical tiger habitats. Mines and dams cause irreversible damage to habitats that are undermined to an extent that afforestation can no longer restore them. As our ministries continue to fail to carry out economic and environmental development hand-in-hand, I guess it is now time for the wildlife to rack its brains! 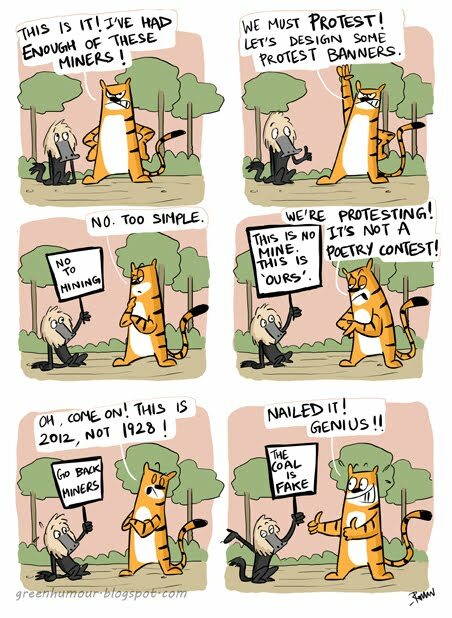 You can now read Green Humour cartoons in the latest issues of Current Conservation magazine ( http://www.currentconservation.org/ ) Also check out the illustrations and designs in the magazines. Pencil Sauce, a Bangalore-based design studio is doing some mind-blowing work with the designs for the magazine. Also, Saevus (http://www.saevus.in/) will soon be featuring a page on cartoons from Green Humour in their bi-monthly journal. your cartoons are smart and quite quirky...good work..